It seems like Quote Roller received an early Christmas present. 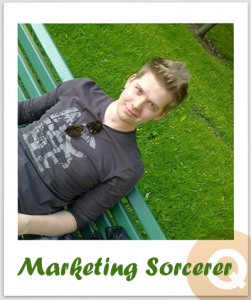 As of December 1st, Quote Roller finally got a marketing wizard named Sasha Kovaliov. You may have already spotted a few interesting blog posts by Sasha and noticed that our facebook page has come to life. Please meet and welcome Sasha, marketing rockstar, avid cook and now the most talkative guy in our office (I am proudly passing this title, btw). Sasha started his career in a large IT company as a sales manager, which required him to create many proposals on a daily basis. He hated working for a huge corp as much as creating sales proposals with word processors as we all used to. That is probably why (after a few journeys in other start-ups) Sasha joined our great team at Quote Roller. Sasha’s mission will be to make sure more and more people get to know and love Quote Roller. Do you have an idea on how to improve our marketing? Drop Sasha a line! [sasha at quoteroller], he would love to hear from you. But enough about work. Besides being a great writer, marketing pro and social media junkie Sasha is a fantastic cook, avid sci-fi fan and just a cool guy. He usually starts working at 8am, gets 6 hours brake at 2pm and knocks another 2 after 8. Adding to the mystery, he also follows a weird diet that I don’t understand (no crops and no potatoes). The most important asset of a start-up is its team. Great people build a great product, great service, and great business. Please welcome Sasha, who is now a part of Quote Roller!